Dow added 47, advancers ahead of decliners 2-1 & NAZ was up only 1 (held back by a weak Microsoft). Bank stocks, traditional market leaders, were flattish. The Alerian MLP Index was at historical record levels after rising another 10 in Apr. The Dow Jones REIT Index gained an impressive 12 in Apr. Junk bond funds did well & Treasuries had their biggest monthly return since Aug as cooling economic growth & the Federal Reserve commitment to sustain monetary stimulus spurred demand for the safety of gov debt. Oil rose, capping an unprecedented 8th straight month of gains, as better-than-expected consumer spending signaled fuel demand may climb. Gold approached $1570, extending a rally to new records, on bets that the dollar will extend a slump. Its chart below shows strong gains in just the last 3 days (green line is today). Caterpillar, a Dow stock, reported Q1 profit soared more than 5-fold & raised its financial outlook for the year as a growing economic recovery boosted demand for mining & construction equipment. 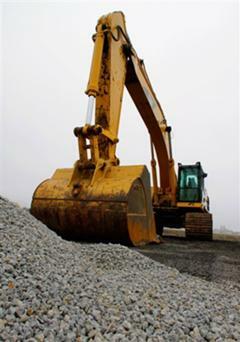 Companies have been holding back investments but now have no choice but to replace aging machinery, boosting CAT sales. EPS was $1.84 , up from a depressed 36¢ last year & revenue rose 57% to almost $13B. Analysts had expected earnings of $1.30 a share on revenue of $11.4B. Based on these results CAT boosted its 2011 outlook, forecasting revenue of $52-54B & EPS of $6.25-6.75. It previously forecast revenue above $50B & EPS of roughly $6. The projection does not include its recent acquisitions of MWM Holding or Bucyrus International because the deals haven't closed yet. The stock rose 2.77 to the 115s after an excellent run off recession lows. Simon Property reported Q1 results jumped 75% on higher operating income, an improving economy & recent acquisitions. The country's largest mall operator also increased its full-year financial outlook which fell in line with estimates by analysts. Funds from operations (FFO) per share rose $1.61 from 94¢ last year. Expectations were for FFO of $1.53. Excluding charges for paying off debt, adjusted FFO was $1.41. Revenue grew 10% to $1B. The company estimates 2011 FFO of $6.55-6.65, up from $6.45-6.60 previously given. Analysts had forecast $6.61. The stock lost 48¢. The average price for gas is up to $3.91, getting sooo close to the record $4.11 in 2008. WalMart (WMT) said today that their customers are getting squeezed by the price rise. This has been a spectacular Apr. To say the earnings reports were well received is an understatement. Worldwide problems are being ignored. While stocks are climbing, gold & Treasuries were also strong with gold reaching new records. This disconnect that can not last (although the 2 have gotten along fairly well in recent months). Dow gained an amazing 1500 in Apr, hardly chump change. Earnings season is winding down, maybe that will bring a change in fortunes. Last year Apr was a good month, extending a longer term gain. But May saw major selling because of European debt problems. But this is a new year with different rules. Dow rose another 44 taking it above 12.8K, advancers ahead of decliners 5-4 & NAZ slipped 3. Banks stocks settled back, with the Financial Index not straying far from 220. The MLP index was up a fraction, above 390, to a new record high, while the REIT fell 3 to the 247s (yesterday's yearly high). Junk bond funds were higher as were Treasuries. Oil is lingering around its 3 year highs & gold keeps rising to new heights on inflation fears (among other looming problems). Microsoft, a Dow stock, had lower sales of its core Windows operating system (down 4.4%), mirroring a recent downturn in personal computers, but strong sales of Office suite & Xbox games took up the slack. MSFT has sold a record-breaking 350M licenses for its Windows 7 since its launch 18 months ago, but demand appears to be waning in an uncertain economy. PC sales, the engine guiding its financial success, fell 1% in Q3. CFO Peter Klein said the company expects corp spending on PCs to outpace consumer PC sales through the next 12 months. He acknowledged that sales of low-end netbooks were suffering particularly, partly because of the success of tablets & other mobile devices. Net income was $5.2B, below $5.99B reported by Apple (AAPL) last qtr. MSFT fell $1.06 & has gone nowhere for over 10 years. Merck, a Dow stock, said Q1 profit more than tripled from strong sales of key drugs & lower costs from integrating its Schering-Plough acquisition offset sales lost to competition from generic versions of its drugs, beating expectations by analysts. EPS was 34¢, up 9¢ from last year & revenue edged up 1% to $11.58B (including several billion dollars from products Schering-Plough bought 2009). Excluding numerous one-time items, 92¢ beat forecast EPS of 84¢ & revenue of $11.38B. MRK raised the bottom end of its 2011 adjusted profit forecast by 2¢, predicting $3.66-3.76. Including charges, it expects $2.04-2.39. "We're very much committed to growth and we think we're off to a terrific start in the first quarter," CEO Kenneth Frazier said. The stock rose 25¢. Chevron, Dow stock, Q1 net income rose 36%, the latest strong earnings report from a major oil company, as it earned higher prices for its oil around the globe. In the US, oil was sold for an average price of $89 per barrel, compared with $71 last year. Internationally, oil was sold for an average price of $95 per barrel, compared with $70 last year. This was partially offset by lower prices in the US for natural gas. EPS rose $3.09 from $2.27 last year, topping expectations. 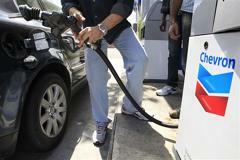 Chevron's revenue rose 25% to $60.3B. The stock was up 14¢. After another strong week for the markets, traders are taking it easy. Some may have already started their long weekends. Earnings season has past the midpoint & grades being given are quite good. Just take a look at the Dow chart below. The MLP index is at a new record high, bringing its yield below 5.8%, & approaching the 5.37% record low set in Jul 2007. There should be no dramatic changes in the PM which will give the Dow another excellent week, up about 300. Dow shot up 72 to an almost 3 year high, advancers ahead of decliners 3-2 & NAZ rose only 2 ahead of the earnings report from Microsft (MSFT). Bank stocks had a good day but the Financial Index continues lumbering around 220. The MLP index has recouped energy & is back at new record highs while the REIT index shot up 3 to an almost 3 year high (above 250). Junk bond funds were a penny or 2 lower from their lofty levels while Treasuries were stronger on inflation fears. The yield on the 10 year Treasury dropped 6 basis points to 3.31%, the low region of its zone in recent months. Oil fell from a 31-month high as the US economy grew at a slower pace in Q1 than forecast & jobless claims unexpectedly rose. Gold surged to a record for the 2nd straight day (the green line in the chart is today's trading) after the Federal Reserve pledged to keep borrowing costs low, eroding prospects for the dollar . The number of contracts signed to buy previously owned homes rose more than forecast in Mar. The index of pending home resales climbed 5.1% after a revised 0.7% increase in Feb, the National Association of Realtors said, versus a forecast of 1.5%. Improving job market, falling home prices & low borrowing costs may help to attract more buyers in coming months. However, foreclosures are worsening the glut of unsold properties. Any increase is coming off a depressed base & it will take many increases to have a substantial impact on this soggy market. Eastman Kodak lost $246M in Q1, its 3rd quarterly loss in the last year, on weaker sales of digital cameras & film. The loss amounted to 91¢ a share which compares with net income of 40¢ last year when results were swelled by $550M in one-time revenue from a digital-imaging patent-litigation triumph. Excluding items, EK lost $1.13 per share & revenue dropped 31% to $1.3B from $1.9B last year. Analysts expected an adjusted loss of 48¢ on revenue of $1.41B. Sales of low-end cameras have been hurt by lingering weakness in discretionary consumer spending & stiff competition from smart phones & video cameras. Part of the decline can be attributed to its attempt to shift to pricier cameras with higher profit margins. The stock lost 32¢, going below $3. Dow Chemical Q1 income gained 34% on stronger sales of products used in everything from smartphones to farming. Sales were robust in emerging countries, such as in the Asia Pacific region & Latin America, but it also saw improvement in regions where economic growth has lagged, such as North America. DOW believes the economy will continue to improve in the US, Western Europe & other developed countries despite high unemployment rates, lingering sovereign debt problems & inflation concerns. EPS rose to 54¢, above 41¢ last year. Adjusted to exclude certain one-time items, EPS was 82¢ & revenue increased 10% to $14.7B. Analysts expected EPS of 67¢ on sales of $13.9B. Prices rose 12%, offsetting higher energy costs. All operating segments reported double-digit price increases, except electronic & specialty materials, health & agricultural sciences (each had 3% increases). The stock rose 79¢ but this is also a reminder that inflation is picking up steam. The average price of gas at the pump yesterday was $3.89 & the trend below is ugly. Markets continue to roar ahead although NAZ was quiet (its breadth was barely positive) as earnings news is driving the rise. But more signals about higher inflation are worrisome & that has sent gold to records only dreamed of last year. European debt issues are lurking in the background, the debt limit for the Treasury has to be raised shortly (a hot polictical debate) & high unemployment rates continue (among other problems). But buyers remain in control of the markets. Dow is up an impressive 300 this week in the heart of earnings season. Not sure earnings deserve that much respect when projecting them forward. Dow rose 40 (after stumbling at the start of trading) to a new multi year high, advancers ahead of decliner 3-2 & NAZ was flat at its highest level since Dec 2000. Bank stocks edged higher. The MLP index slipped a fraction in the 388s while the REIT index shot up 2+ to 250, a new high since the collapse in mid 2008. Junk bond funds were flattish while Treasuries rose on weak jobless claims data. But the yield on the 10 year Treasury bond remains close to the 3.4% rut it's been in for months. Oil fluctuated after the US said the economy grew at a slower pace than forecast in Q1 & gas prices surged after a report that US supplies fell to the lowest level since 2009. Gloomier economic news sent gold to a fresh record high. Just 2 months ago, it was at 1410! More people sought unemployment benefits last week, the 2nd rise in 3 weeks. Applications for unemployment benefits jumped 25K to 429K according to the Labor Dept, the highest in 3 months. The 4-week average rose to 408K, its 3rd straight rise & the first time it has topped 400K in 2 months. Auto factory shutdowns, stemming from supply disruptions in Japan, could have caused applications to rise, but only one state reported auto-related layoffs & the increase was modest. Unemployment benefit applications trended down for about 6 months, but have leveled off in recent weeks suggesting companies could be cutting more workers. More than 3.6M are receiving unemployment benefits from state unemployment programs. Millions more are receiving aid under emergency programs put in place by Congress during the recession. All told, 8.2M are receiving unemployment benefits. The recovery is slow & uneven. The economy slowed sharply in Q1 as high gas prices cut into consumer spending, bad weather delayed construction projects & the federal gov slashed defense spending by the most in 6 years. The Commerce Dept said the economy grew at a 1.8% annual rate in Q1, weaker than the 3.1% growth rate for Q4 2010 & the worst showing since last spring when the European debt crisis slowed growth to a 1.7% pace. An inflation gauge in the report showed consumer prices rose at the fastest pace in nearly 3 years, with most of the increase coming from higher fuel costs. Consumers boosted spending at a 2.7% pace, down from a 4% pace in the prior qtr, the weakest pace since last summer. All is not well in this recovery. Exxon Mobil, a Dow stock & Dividend Aristocrat which raised the div yesterday, reported big jumps in Q1 results (the best since 2008), beating forecasts thanks to high oil prices & healthy refining margins. Q1 net income rose 69% to $10.65, ahead of an average forecast of $9.99B (helped by its takeover of XTO Energy last year). Brent crude was 38% higher in Q1 compared with the 2010 period Oil & gas production rose 10% to 4.82M barrels of oil equivalent per day (boepd), thanks to the XTO takeover. EPS was $2.14 but the stock fell $1.10 after a great run in recent months. Procter & Gamble, a Dow stock & Dividend Aristocrat, tempered earnings outlook for 2011 because of fast-rising costs for raw materials & fuel along with sluggish economies in the US & other developed countries. Profits & sales rose in its Q3, led by sales in emerging markets. Plans for more price increases were announced. EPS was 96¢ on revenue of $20.2B. Analysts were expecting 97¢ on sales of $20.24B. PG reported double-digit sales increases in Asia, Brazil, & India, areas the company is increasingly relying on for sales growth. Developed market sales, accounting for 2/3 of business, continued to be nearly flat. "The results show that consumers in developed markets are struggling," CEO Bob McDonald said. "They're struggling with higher gasoline prices ... which is causing them to make choices." Prices were increased on Gillette blades & razors, Duracell batteries, Pampers diapers & wipes, Charmin toilet paper & Bounty paper towels because pulp costs are up 10% for the paper-related products. Diesel oil is up 25%, adding to transportation costs, while resin used in packaging rose 15%. PG dropped the high end of its earnings outlook for 2011, to $3.91-3.96 per share from $4.01. Analysts are expecting $3.96 on $82B in revenue. It also narrowed its outlook for organic sales, excluding impacts of currency fluctuations & acquisitions or divestitures, to 4-5% from 4-6%. For overall sales, PG expects overall sales growth of 4-5%, analysts are projecting 3% to $82B. The stock was up 23¢. A disappointing report on jobless claims & dreary numbers about the economic recovery in Q1 are being ignored. Buyers are eager to pay higher prices even as earnings guidance is subdued. Most disturbing for me is the continued rise in gold prices, bets on higher inflation & weaker economic data. As has been the case for months, 2 opposites, stock averages & gold, are rising simultaneously.